Power Quality Evaluation is essential in minimizing your businesses down time and in protecting critical electronic equipment such as computers, computer servers, computer controlled machines, and processes, printers, copiers, faxes, phone systems and all other equipment and devices that use printed circuit boards and surface mount technology can be adversely affected (to the point of failure) by voltage and current abnormalities. At Highlights Electrical we are experts in evaluating and correcting Houston power quality issues than can damage sensitive key components of your operation. Generally speaking, any deviation from a normal voltage source (either DC or AC) can be classified as a power quality issue. Power quality issues can be very high-speed events such as voltage spikes, voltages sags, high frequency noise, and total power loss. 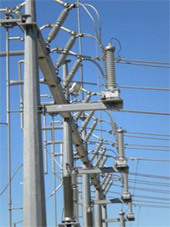 Electrical equipment will be affected differently by power quality abnormalities. By analyzing the electrical power coming in to your facility, and evaluating the equipment or load, Highlights Electrical can determine if a power quality problem exists and if it is something to be concerned about. Most power quality issues do not originate with the electric utility company providing your power! In fact, the majority of these problems are actually created within your facility! Unbalanced circuit loading, and various incompatibility issues between certain types of equipment (laser printers, copiers etc., and their interaction with other devices may be to blame). We can verify the power quality by installing special types of recording equipment and specialized test equipment to monitor the electrical power coming in to your business. This type of test equipment will provide information used in evaluating if the electrical power is of sufficient quality to reliably operate the equipment you depend on. Monitoring will provide us with valuable data, however the data needs to be interpreted and applied to the type of equipment being powered. Let the “Seasoned” Professional Electricians at Highlights Electrical answer and resolve all of your questions and concerns regarding Power Quality Issues that you may be experiencing, or may suspect. In business since 1986, we have the background, experience and reputation to service all of your electrical and lighting needs.